galette It is my favorite time of year, Fall! I love the fall more than any other season. Even though I am sitting here with a long sleeve shirt, hoodie, flannel pants, socks, fuzzy slippers and a frozen nose, I LOVE FALL! I adore the food, the weather, and all the wonderful accessories I get to wear. Ok enough swooning over Fall, let’s talk food. If you have never made a galette you need to rectify that immediately. Galette is the fancy Frech way to describe a free-form crusty flat tart. It’s similar to the Spanish word for cracker/cookie which is galleta. I love galette because they are incredibly easy to make, beautiful to look at, and delicious to eat. It’s a great dish for when you want to fancy but don’t try hard. With frozen root vegetables and store-bought pie crust, this galette comes together in no time. The sweetness from the potatoes and apples in combination with the onions and herbs is delightful. 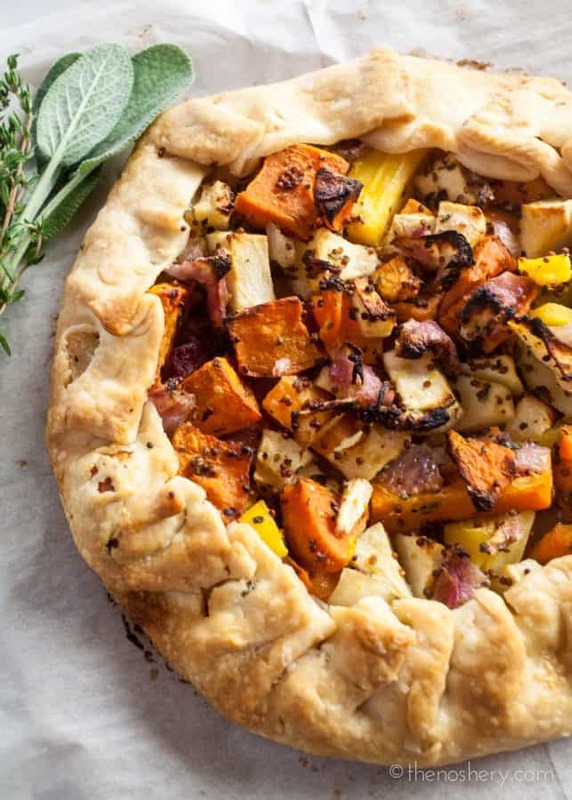 It’s like a savory Thanksgiving tart. The great thing about a recipe like this is that you can easily make it your own. You can swap pears for apples, butternut squash or pumpkin for sweet potato. 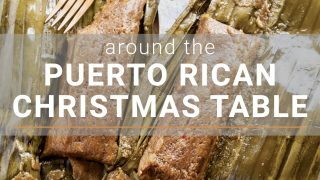 You could add roasted pecans, dry cranberries or blue cheese. If you want to go another route, you could ditch the crust all together and make it into a sort of roasted salad. The possibilities are endless. Make this for your next dinner party and your sure to impress your guest. I also encourage you to experiment and make it your own. If you have more of a sweet tooth check out my cherry and apricot galette. A galette is a free-form tart. 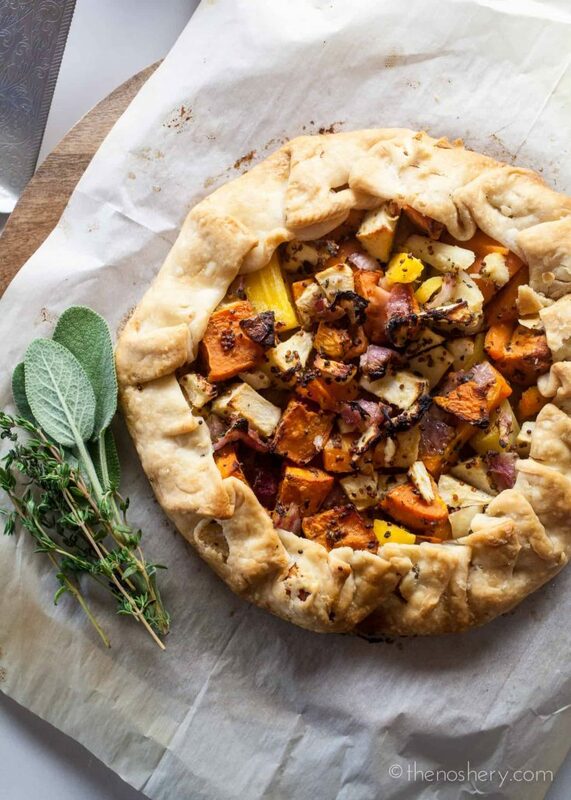 This galette is made of savory root vegetables and apples tossed with a whole grain mustard dressing. 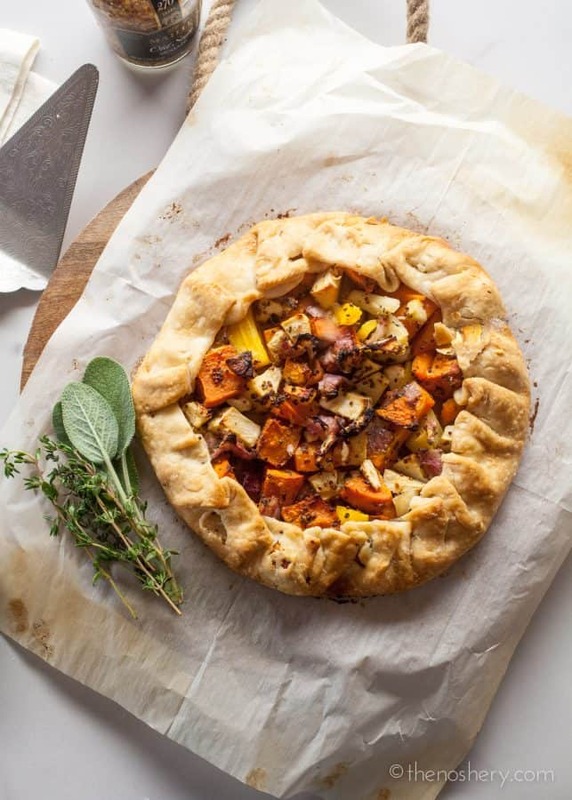 Using frozen root vegetables and store-bought pie crust makes it easy to make and it's sure to impress your family or guests. Roll out pie crusts according to package directions. Place crusts onto sheets of parchment paper. In a large bowl, combine frozen root vegetables, diced apple, 3 tablespoons butter, mustard, apple cider vinegar, sage, and thyme and toss gently to combine. Season with salt and pepper and toss again. Divided the vegetable mixture evenly between the two crust. Spread the vegetables on the crust leaving 1 1/2 inches from the edge. Fold and pleat the dough over the edge of the filling. Brush the crust with remaining melted butter. Using the parchment paper transfer the galettes to a large sheet pan. Bake until the crust is brown and the filling is tender and caramelized, about 45 - 55 minutes. Cool the galette briefly on a wire rack. Transfer to a cutting board, slice and serve. Did you thaw the vegetables first or use them frozen to go into the oven? I added them frozen into the bowel and filled the crust. They will thaw a little while making the filling but there is no need to thaw the vegetables. 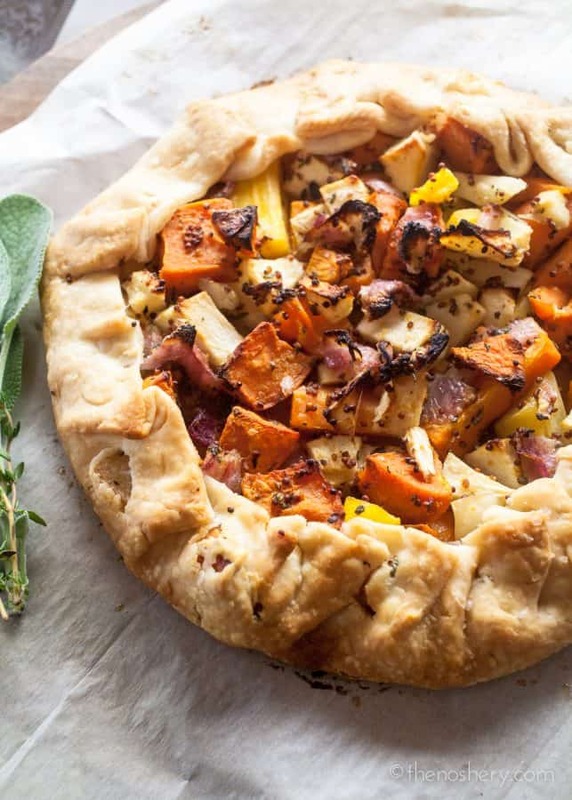 That is stunning, I love the idea of a savory galette, and it would make such a nice presentation at a party! This galette looks delicious! Never tried to make one of these myself, maybe it’s about time! It’s savory and the crust looks pretty darn good. A lovely galette! I love your savory version.